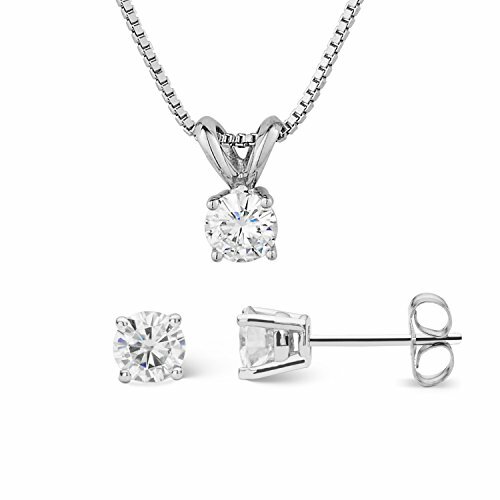 This gorgeous set includes Forever Classic stud earrings and a Forever Classic pendant necklace. The charming Forever Classic stud earrings showcase 4.5mm round brilliant cut moissanite gemstones and the necklace showcases a 4.5mm round brilliant cut moissanite gemstone. Both pieces are beautifully crafted in sterling silver and secured in a four prong setting. The pair of earrings has a total Diamond Equivalent Weight (DEW) of 0.66cttw (Actual Weight 0.58cttw). The pendant has a total Diamond Equivalent Weight (DEW) of 0.33ct (Actual Weight 0.29ct). The charming Forever Classic stud earrings showcase 4.5mm round brilliant cut moissanite gemstones and the necklace showcases a 4.5mm round brilliant cut moissanite gemstone. Both pieces are beautifully crafted in sterling silver and secured in a four prong setting. The pair of earrings has a total Diamond Equivalent Weight (DEW) of 0.66cttw (Actual Weight 0.58cttw). The pendant has a total Diamond Equivalent Weight (DEW) of 0.33ct (Actual Weight 0.29ct).